Gothai Sivaprakasam, Palanivel Ganesan. These authors were equally contributed. Neuroinflammation has been involved in all neuropathological diseases, and the inhibition of neuroinflammation is a pivotal aspect in management of neuroinflammatory related diseases. Microglia is brain-specific macrophages with a wide-ranging role in modulating the immune system and inflammation related neuro-degeneration. Despite the apparent divergence among microglia in vitro and in vivo, the co-culture of microglia has established a useful strategy to discover the potential neuroprotective mediators and to modulate the activation of microglia in response to known central nervous system stimulants. Activated microglia demonstrates functional plasticity. They are fortified with various toll-like receptors called pattern-recognition receptors to detect brain invading pathogens. Most of the studies use primary culture. However, proliferation of primary microglia has limited capacity by which fresh isolation is necessary depending on type of experiment. For instance, about 15-30 brains are needed to produce cells for research on signaling or disease mechanism, whereas more number of brains are needed for biochemical work or chip expression analysis. This enormously affects the overall animal consumption in biomedical study. A cell line to substitute primary microglia would be mandatory, as it can aid in retaining animal consumption, time, labor, laboratory consumables, and ease the research work. Most in vitro experiments with modeling reactive microglia are performed by using BV-2 cell line. BV-2 cells are immortalized microglial cells by infecting murine microglial cells with raf/myc recombinant retro-virus and are used as a substitute for primary microglia. Research on BV-2 cells demonstrates BV-2 behaves similarly to primary microglia in cytokine secretion, synaptic plasticity and neuronal networking. BV-2 cell lines are able to yield a larger number of microglial cells, thus providing an alternative model to overcome animal usage in vitro models. It is well acknowledged that microglia can be activated by lipopolysaccharide (LPS) and is recognized as a useful in vitro tool for studying neuroinflammatory mechanisms. LPS is a strong endotoxin, and is abundantly found within the cell wall of Gram (-) bacteria. It initiates acute inflammatory response and has multiple pathological effects on human beings. In LPS-treated neuroinflammation models, activated microglia has been linked with perpetual neuronal cell injury, changes in cognitive impairment and overall potentiation. Thus, agents that reduce microglial activation and their proinflammatory responses might be considered as an important therapeutic strategy for treating neuroinflammatory disorders. Medicinal plants and their extracted natural products or secondary metabolites have been conventionally used to cure a number of inflammatory related illnesses. Moringa oleifera (M. oleifera) is being widely used by people of Tamil nadu and other Southern states of India,. This is a non-toxic plant and can be eaten as vegetable and salad. In Ayurveda, it is used to treat diarrhea, skin diseases, night blindness, indigestion, fever, headaches, dizziness, vertigo and convulsive illnesses. M. oleifera leaf extract (MLE) has drawn much attention as a significant source of stigmasterol, tocopherol, vitamin A, C, B, kaempferol and quercetin, which are responsible for its pharmacological activities, including antioxidant, anti-inflammatory, anti-epilepsy, anti-obesity, anxiolytic and memory improving activities both in vitro and in vivo,. To the best of our knowledge, there are no reported studies describing the anti-inflammatory activity of MLE on neuroinflammation. Hence in the present study, we explored the molecular mechanism of the anti-inflammatory potential of MLE in BV-2 microglia cells using LPS-stimulation. The collected M. oleifera leaf from the farm of No.2 at Universiti Putra Malaysia, Malaysia was deposited in the IBS Herbarium unit of specimen code SK 1561/08 for future reference. The dried leaf was powdered and defatted using 90% ethanol three times by macerating at room temperature. The supernatant was concentrated at 25 °C using rotary evaporator (Virtis Bench Top K, United States). The ethanolic extract was stored at 20 °C and was re-diluted in distilled water for experiments. The BV-2 microglial cells were maintained in DMEM enriched in 5% FBS containing 1% of 100 units/mL of penicillin/streptomycin at 37 °C in a 5% CO2 humidified incubator. Cells were subcultured in 75 cm2 flasks reaching confluency of 80% to 90%; they were trypsinized and were seeded at a density of 1 × 104 cells/mL in 96 well cell culture plate. Various MLE concentrations were added which was dissolved in DMSO at concentrations of less than 1% to make sure that the DMSO exerted no deleterious effects on the activity and left overnight. After pretreatment for 2 h with MLE, cells were induced with LPS (100 ng/mL) except for MTT assay. The group without pretreatment and LPS induction was control group and the group with only LPS only was LPS group. MTT procedure was used to study the cell viability. The BV-2 microglial cells were maintained in DMEM enriched in 5% FBS containing 1% of 100 units/mL of penicillin/streptomycin at 37 °C in a 5% CO2 humidified incubator. Cells were sub-cultured in 75 cm2 flasks reaching confluency of 80% to 90%. The cells was trypnisied and were seeded at a density of 1 × 104 cells/ml in 96 well cell culture plate. Various MLE concentrations (6.25 to 300 μg/mL) were added which was dissolved in DMSO at concentrations of less than 1% to make sure that the DMSO exerted no deleterious effects on the activity and left overnight. After treatment, the aliquots were replaced with fresh DMEM culture medium (100 μL). A total of 10 μL of MTT solution (5 mg/mL) were added and incubated for 4-6 h at 37 °C. 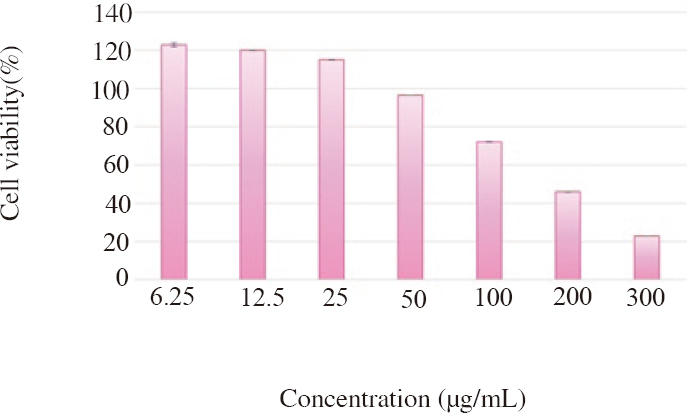 The purple formazan product obtained in cells were diluted in DMSO and the absorbance reading (540 nm) was measured using ELISA reader (with reference at >600 nm). The percentage of surviving cells was represented as percentage of non-treated sample (in absence of MLE treatment). 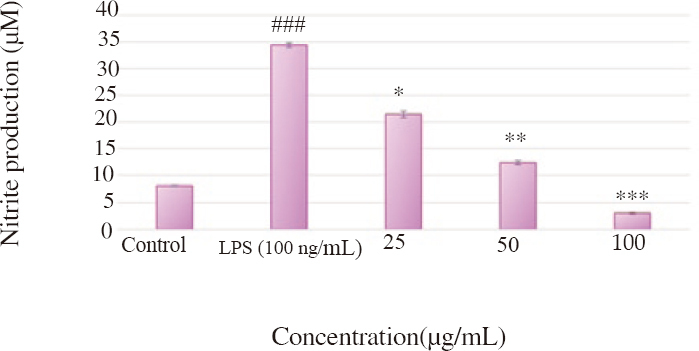 In all other experiments, the cells were pretreated with MLE extract at various concentrations (25, 50 and 100 μg/mL) for 1 h before the addition of LPS (100 ng/mL). Groups in absence of MLE treatment was regarded as control group. The amount of nitrite accumulated in the media from liberated NO by the cells was determined with Griess reagent. Cells (5× 105 cells/mL) were cultured in 24-well plates with 2 000 μL DMEM media, followed by pre-treatment with and without MLE (25, 50 and 100 μg/mL) before incubating in a medium containing LPS (100 ng/mL) overnight. Then, the supernatant from cultured media (50 μL) was allowed to react with the same amount of Griess chemical (0.1% naphthyl ethylene diamine and 1% sulfanilamide in 5% H3PO4) in 96-well plates in the dark for 10 min. The absorbance value (540 nm) was recorded using an ELISA reader (Tecan Trading AG, Switzerland). The serially diluted sodium nitrite (0–100 μM), using DMEM medium were used to plot the standard nitrite curve. The levels of pro-inflammatory cytokines (IL-1β, IL-6, TNF-α) in the cell from the treated culture medium were analyzed by ELISAbased kits, according to the manufacturer's instructions (R&D Systems, Minneapolis, MN, USA). Briefly, cells (1 × 106 cells) were plated in 6 well plates and pretreated with medium containing MLE (25, 50, and 100 μg/mL) before incubating with LPS overnight. Later, cells were collected, washed in ice-cold PBS and the total protein was extracted using RIPA buffer. The absolute protein concentration was determined by Bradford assay. Equal amount of protein was loaded and separated in 12% sodium dodecyl sulfate-polyacrylamide gel electrophoresis. Proteins were shifted to a nitrocellulose membrane and blocked with low fat milk for 1 h. The blots were then probed with primary antibodies: cyclo-oxygenase-2 (COX-2) (35-8200), inducible nitric oxide synthase (iNOS) (MA5-17139), β-actin (MA5-15739) from Thermo Scientific and IκB-α from Santa Cruz Biotechnology (Santa Cruz, CA, USA), overnight at 4 °C. After washing repeatedly with Tris-buffered saline (TBS), pH 7.4, with 0.1% Tween 20 (TBS-T), the membrane was captured with appropriate anti-rabbit/mouse immunoglobulin G-horseradish peroxidase-labeled secondary antibodies for 1 h at room temperature. After final wash, the membrane was visualized with chemiluminescence substrate and exposed to detection by gel documentation system. For loading control, β-actin was used. All data were stated as the mean ± standard deviation (SD) of three independent experiments. One-way ANOVA (ANOVA) SPSS version 21.0 software (SPSS, USA) was used to compare with control and treated groups using Student's t-test. Difference was considered as statistically significant as P<0.05. The cytotoxicity of the MLE towards BV-2 cells was studied using MTT. It showed that MLE exhibited the dose dependent effect on BV-2 cell line. MLE treatment of different concentrations (6.25-300 μg/mL) did not affect overall neuronal viability of BV-2 microglia cells up to 50 μg/mL. In particular, cells treated with MLE at a concentration of 6.25, 12.5, 25, and 50 μg/mL showed the most potent viability without toxic effect. The result revealed that MLE potentially repressed the release of NO in BV-2 cells after stimulation with LPS in concentration-dependent manner [Figure 2]. 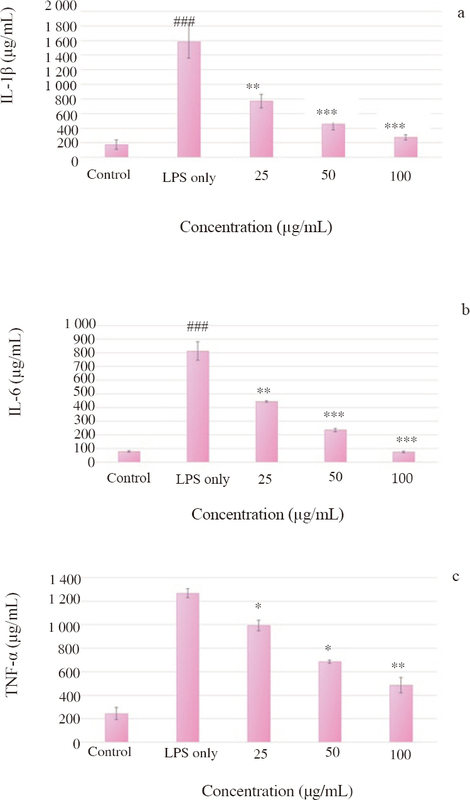 At maximum effective concentration (50 μg/mL), induction of NO from LPS-activated BV-2 cells was specifically repressed (90%) by MLE without affecting cell viability. To eliminate the likelihood that the cell cytotoxicity reduced NO, the results from cytotoxicity (MTT) of MLE were used as reference. MLE showed no neurotoxicity till 50 μg/mL in BV-2 cells [Figure 1]. Therefore, the suppression of NO by MLE was not owing to their toxic nature. Figure 1: Effect of MLE on BV-2 microglial cell viability. Cell viability treated with MLE was done using MTT assay. The results are expressed as proportions of surviving cells compared with controls samples. Bars are mean ± SD (n = 3) for three independent experiments. Figure 2: Effect of MLE on NO release. Cells plated in 6-well plates were treated with MLE at virous concentrations (25, 50 and 100 μg/mL) and then treated with LPS (100 ng/mL) for 24 h. The nitrite accumulation in the medium was measured by the Griess protocol. Data are expressed in mean ± SD (n= 3) from three independent experiments. ###P< 0.001, when compared with control group. *P <0.05, **P <0.01 and ***P <0.001, denote significant differences as compared to LPS alone treated group. To responsively identify factors responsible for the anti-inflammatory action of MLE, its inhibitory effects on cytokine activity towards BV-2 were carried out. The control cells (group without LPS and MLE treatment) maintained IL-1β, IL-6 and TNF-α at basal level [Figure 3]. LPS treatment up regulated TNF-α, IL-6 and IL-1β release significantly. MLE treatment significantly suppressed them in a concentration-dependent fashion. Thus, the results indicate that MLE inhibited the expression of these cytokines, indicating that MLE inhibited the initial release of inflammatory response under LPS-stimulation. Figure 3: Effect of MLE on IL-1β (a), IL-6 (b) and TNF-α (c) production. The regulation of pro-inflammatory cytokine level by MLE was quantified by ELISA kits test. The cells were pre-treated with MLE at variou concentrations (25, 50 and 100 μg/mL), then treated with LPS (100 ng/ mL) for 2 h. Data are represented as the mean ± SD (n = 3) from three independent experiments. ###P <0.001, when compared with control group. *P <0.05, **P <0.01 and ***P <0.001, denote significant differences as compared to LPS alone treated group. LPS significantly increased expression level of iNOS and COX-2 proteins compared with control sample [Figure 4]. However, MLE treatment suppressed the increase of iNOS and COX-2 proteins considerably in concentration dependent manner. Further, translocation of nuclear factor-κB (NF-κB)/p65 subunit to nucleus was analyzed through IκB-α degradation. Upon LPS stimulation, IκB-α phosphorylation was promoted significantly, which is accountable for the instigation of NF-κB activation. However MLE treatment blocked cytosolic IκB-α phosphorylation and improved the level in concentration-dependent manner [Figure 4]. Figure 4: Effect of MLE on iNOS, IκB-α and COX-2 expressional levels in LPS-induced BV-2 cells. (a) The iNOS, COX-2 and IκB-α expression in the LPS (100 ng/mL)- stimulated BV-2 cells in MLE treatment (25, 50 and 100 μg/mL) was measured by western blot analysis. The β-actin was used internal control. (b-d) Densitometry analysis results of the effect of MLE on protein expression. ###P <0.001 were LPS versus control. *P <0.05, **P <0.01 and ***P <0.001: LPS only group significantly different from LPS + treated group (L+D25, L+D50, L+D100). Inflammation is one of the main responses to injury in body. Organism experiencing inflammation shows symptoms like flare, fever, pain and swelling. Neuroinflammation is inflammation of the nervous system, and now is regarded as an early and main trigger in the pathology of neuroinflammatory disease. Microglia as the primary resident, located in the brain, maintains the integrity of the central nervous system by modulating the homeostasis of innate immunity. The evolving brain is triggered by different aspects, including excitotoxicity, inflammation and oxidative stress. Under such pathological settings, activated microglia contributes to early events in the development of pathophysiology that is related to impairment, behavioral deficits, and neuronal cell death caused by the exaggeratedly released pro-inflammatory cytokines, including COX, iNOS, reactive oxygen species, as well as pro-inflammatory cytokines like TNF-α, IL-1β, and IL-6. The release of such mediators and cytokines results in removing damaged tissue and repairing injury. The activation of microglial cell is necessary for brain host defense. However, when the neuronal insult becomes chronic, microglia is activated ultimately leading to catastrophic consequences, such as neuroinflammation. LPS is the main constituent of the Gramnegative bacteria's outer membrane, making them as the main target for the identification of immune system, and activates the immunological responses in cells. Over expression of microglia by LPS stimulates inflammatory reactions through signal transduction event of Toll-like receptor 4, giving rise to the expression of pathways such as NF-κB, which is largely involved in neurodegenerative processes. NF-κB activation and its translocation via phosphorylation of IκB-α are crucial for the liberation of the various cytokines in microglia in response to LPS. Thus, the amelioration of this microglial activation through inhibition NF-κB pathway may be one of the discernible therapeutic strategies for various neurodegenerative diseases. NO is a critical mediator of inflammation and neurotransmitters. In vitro and in vivo experiments discovered that aberrantly elevated levels of NO nitrite free radicals cause brain injuries and neuroinflamatory diseases. It is well documented that LPS can be used to over express iNOS in microglial cells of rodent brains. Many studies have also demonstrated neuroprotection with iNOS-inhibitors. In agreement, inflammatory mediator (NO) modulation has a vital part in improving the neurotoxicity related diseases. In this study, MLE inhibited the accumulation of NO in LPS-induced BV-2 cells. Besides, substantial evidence showed that MLE is responsible for inhibition of NO and it was not the consequence of MLE cytotoxicity via MTT assay, indicating that inhibition of NO by MLE is linked with bioactive compounds. Studies show that compounds such as quercetin and kaempferol in MLE are responsible for its beneficial anti-inflammatory actions. Collected data propose that MLE may have neuroprotective properties to mitigate LPS-induced neuroinflammatory response in BV-2 cells. TNF-α, IL-1β, and IL-6 are small secretory proteins, involved in regulation of inflammation and immunity. Activated microglia is linked to increased levels of these cytokines (TNF-α, IL-1β, and IL-6) in inflammatory states. TNF-α initiates and regulates the signaling cascade of other cytokines in response to inflammation to trigger neuron cell injury. IL-1β is an important cytokine induced during the commencement of a hormone and inflammatory cascade. The IL-6 on the other hand is a pleiotropic cytokines, involved in haematopoiesis and host defense, and mainly supports the regulation on the inflammatory response. Natural compounds are alternative chemotherapeutic agents of inflammatory diseases, and are able to suppress the release of pro-inflammatory cytokines. In the current work, MLE repressed the release of TNF-α, IL-1β, and IL-6 in LPS-induced BV-2 cells. A similar research manifested the ginseng inhibited TNF-α, IL-1β, and IL-6 in activated microglia, and reported that the therapeutic effects is due to presence of flavonoids. The presence of high flavonol contents in MLE validates the possibility of MLE as a neuroprotectant by reducing inflammation. Recent studies have demonstrated that IKK/NF-κB is the main pathway involved in microglial activation processes. Coordination of pro-inflammatory cytokines, iNOS, COX-2, TNF-α, IL-1β, and IL-6 transcription is mainly controlled by NF-κB. Inactive NF-κB allied with an inhibitory subunit, IκB-α in cytoplasm. LPS or proinflammatory cytokines activates NF-κB and induces the shift of NF-κB into nucleus via degradation of IκB-α. From this study, it was observed that MLE treatment enhanced the phosphorylation of IκB-α signifying that MLE protects the IκB-degradation. From this data, the down-regulation of the inflammatory cytokines in stimulated BV-2 cells by MLE is to a degree linked with the potential of MLE to inhibit the IκB/NF-κB signaling pathway. Though this work was performed on LPS-stimulated BV2 microglia cells, the possible anti-inflammatory role of MLE on microglia is indicated. This paradigm partially suggest that this plant based medicine may play a therapeutic role in preventing and/or delaying the onset and development of neurodegenerative disorders. We have demonstrated that the anti-inflammatory effects of MLE are due to down-regulation of pro-inflammatory cytokines (TNF-α, IL-6 and IL-1β). The anti-inflammatory mechanism of MLE on LPS-induced BV-2 cells is by preventing activation of IkB/NF-κB signaling pathway. Taken together, our results suggest that MLE is a therapeutic candidate for the treatment or prevention of neuroinflammation in neurodegenerative diseases. However, the in-vitro nature of our study limits conclusions regarding MLE's effects on the in-vivo neuroinflammatory response. Further studies are required to investigate the anti-inflammatory and neuroprotective effects of MLE in animal models of neurodegenerative disease. This research was supported by the Basic Science Research Program through the National Research Foundation of Korea (NRF) funded by the Ministry of Science and ICT (NRF-2017R1C1B2010276 and 2017R1A2A2A07001035). Lenz KM, Nelson LH. Microglia and beyond: Innate immune cells as regulators of brain development and behavioral function. Front Immunol 2018; 9: 698. Kigerl KA, de RiveroVaccari JP, Dietrich WD, Popovich PG, Keane RW. Pattern recognition receptors and central nervous system repair. Exp Neurol 2016; 258: 5-16. Lian H, Roy E, Zheng H. Protocol for primary microglial culture preparation. Bio Protoc 2016; 6(21): e1989. Sarkar S, Malovic E, Sarda D, Lawana V, Rokad D, Jin H, et al. Characterization and comparative analysis of a new mouse microglial cell model for studying neuroinflammatory mechanisms during neurotoxic insults. Neurotoxicol 2018; 67: 129-140. He Y, Yao X, Taylor N, Bai Y, Lovenberg T, Bhattacharya A. RNA sequencing analysis reveals quiescent microglia isolation methods from postnatal mouse brains and limitations of BV2 cells. J Neuroinflammation 2018; 15(1): 153. Sochocka M, Diniz BS, Leszek J. Inflammatory response in the CNS: Friend or foe. Mol Neurobiol 2016; 54(10): 8071-8089. Saurabh D, Astha T, Prabhat K. Medicinal properties of Moringa oleifera: A review. Int J EducSci Res Rev 2016; 3(2): 173-184. Sanjive K. Medicinal importance of Moringa oleifera: Drumstick plant. Indian J Sci Res 2017; 16 (1): 129-132. Pare D, Hilou A, Ouedraogo N, Guenne S. Ethnobotanical study of medicinal plants used as anti-obesity remedies in the nomad and hunter communities of Burkina Faso. Medicines (Basel) 2016; 3(2): 9. Chin, CY, Jalil J, Ng PY, Ng SF. Development and formulation of Moringa oleifera standardised leaf extract film dressing for wound healing application. J Ethnopharmacol 2018; 15(212): 188-199. Gothai S, Katyakyini M, Norhaizan ME, Suresh KS, Arulselvan P. Anticancer potential of Alternanthera sessilis extract on HT-29 human colon cancer cells. Asian Pac J Trop Biomed 2018; 8(8): 394-402. Katyakyini M, Gothai S, Khaleel MH, Badran S, Suresh K, Norhaizan ME, et al. 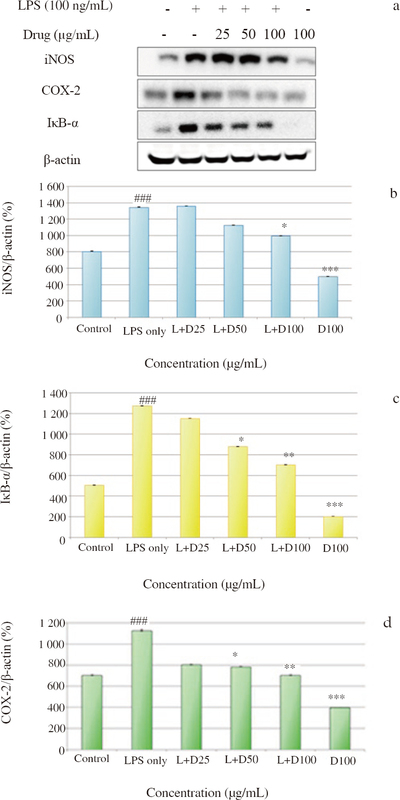 Suppression of proinflammatory cytokines and mediators in LPS-induced RAW 264.7 macrophages by stem extract of Alternanthera sessilis via the inhibition of the NF-κB Pathway. J Immunol Res 2018; 1: 3430684. DiSabato DJ, Quan N, Godbout JP. Neuroinflammation: The devil is in the details. J Neurochem 2016; 139 (2): 136-153. Lutz JA, Kulshrestha M, Rogers DT, Littleton JM. A nicotinic receptor-mediated anti-inflammatory effect of the flavonoid rhamnetin in BV2 microglia. Fitoterapia 2014; 98: 11-21. Gupta M, Gurcharan K. Aqueous extract from the Withania somnifera leaves as a potential antineuro inflammatory agent: A mechanistic study. J Inflammation 2017; 13: 193. Richard MR. How neuroinflammation contributes to neurodegeneration. Science 2016; 353(6301): 777-783. Kempuraj D, Thangavel R, Natteru PA, Selvakumar GP, Saeed D, Zahoor H, et al. Neuroinflammation induces neurodegeneration. J Neurol Neurosurg Spine 2016; 1(1): 1003. Loane DJ, Kumar A. Microglia in the TBI brain: The good, the bad, and the dysregulated. Exp Neurol 2015; 275(3): 316-327. Kim JJ, Kang YJ, Shin SA, Bak DH, Lee JW, Lee KB, et al. Phlorofucofuroeckol improves glutamate-induced neurotoxicity through modulation of oxidative stress-mediated mitochondrial dysfunction in PC12 cells. PLoS One 2016; 11(9): e0163433. Adewale B, Norazah B, Ravikanth V, Satyajit S, Olusegun A, Olumayokun O. Moringa oleifera inhibit neuroinflammation in LPS activated BV2 microglia. Pharm 2016; 29(1): 634-700. Lee YY, Park JS, Jung JS, Kim DH, Kim HS. Anti-inflammatory effect of ginsenoside Rg5 in lipopolysaccharide-stimulated BV2 microglial cells. Int J Mol Sci 2013; 14: 9820-9833. Sudhakar RS, Howard JF. Targeting microglial activation states as a therapeutic avenue in Parkinson's disease. Ront Aging Neurosci 2017; 9: 176. Agraja P, Swapna M. Cytokines and anti-cytokine therapy in periodontal disease. Dent Medsci 2017; 16(3): 63-70. Mariem TZ, Thomas V, Sakthivel V, Graeme SC, Darius W. Development and characterisation of a novel NF-κB reporter cell line for investigation of neuroinflammation. Mediat Inflamm 2017; 1–13. Arulselvan P, Tan WS, Gothai S, Muniandy K, Fakurazi S, Esa NM, et al. Anti-inflammatory potential of ethyl acetate fraction of Moringa oleifera in downregulating the NF-κB signaling pathway in lipopolysaccharide-stimulated macrophages. Mol 2016; 21(11): 1452.